Garlic production has increased significantly in New York over the last few decades, and garlic is now considered to be an important niche crop. In 1992, only 11 acres of garlic were reported in New York, but by 1997 the number grew to 153 acres and by 2007 it again doubled to 306 acres. Garlic is currently estimated to be a $20 million dollar crop. New York is the fifth largest garlic producing state in the country, and ten percent of all New York vegetable farms report growing garlic. That is a higher percentage of growers than for broccoli, cabbage, carrots, lettuce, or onions. Garlic is sold at farmers' markets from mid-summer to the fall throughout the state. Garlic is also sold at festivals which take place throughout the Northeast from August through October. New York's largest festival is in Saugerties, in September. Festivals are important outlets for growers and important agrotourism events for the cities that host them. Varieties of garlic grown in New York tend to be different from those you will find in the grocery store. 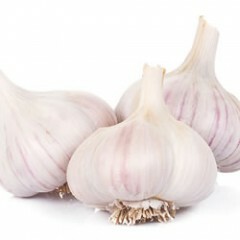 New York is known for excellent 'hardneck' garlic, which has a hard stalk running through the center of the bulb. The flavor of our hardneck garlic is often considered to be stronger and more unique than the flavor of 'softneck' varieties found in the grocery store and grown primarily on the West Coast or in China. Eriophyid mites are a post-harvest pest which can significantly lower the quality of garlic in storage. Article by Crystal Stewart and Frank Hay. Second year data from post-harvest studies. All work was funded by Northeast SARE. Check out the presentations and resources from the Cornell Vegetable Program's 2019 Garlic School that was held March 20th, 2019 in Batavia, NY.